On Jan. 25, 1959, before a small group of cardinals gathered in the Basilica of St. Paul Outside the Walls, the newly elected Pope John XXIII announced his intention to call a council. It would become the Second Vatican Council. The announcement caught everyone by surprise. First of all, an ecumenical (or “worldwide”) council such as Vatican II is a rare event in the life of the church. Catholics count only 21 such councils in the church’s 2,000-year history. Since the Protestant Reformation 400 years ago, there have been only two such councils. An announcement like Pope John’s does not come along every day. Another cause for surprise had to do with the reason for a new council. Previous councils were all called to respond to some threat facing the church. The Council of Nicaea, for example, was convoked in 325 to address the Arian heresy (the false belief that Jesus was not truly divine, but created) that was tearing the church apart. Similarly, the Council of Trent (1545-1563) was an attempt to answer the challenge of the Reformation. When Pope John made his announcement, no such threat loomed on the horizon. No obvious enemy mobilized Vatican II. Instead, Pope John said the idea for the council came to him as a divine inspiration, “like a flash of heavenly light.” In his announcement, he chose not to identify problems. Rather, he named two positive goals. The first was to promote “the enlightenment, edification and joy” of the entire church. The second was to reach out to other Christians in a spirit of reconciliation. The reason for the council was proactive, not reactive. Pope John framed its purpose in the positive terms of hope and opportunity, rather than the negative terms of danger and threat. 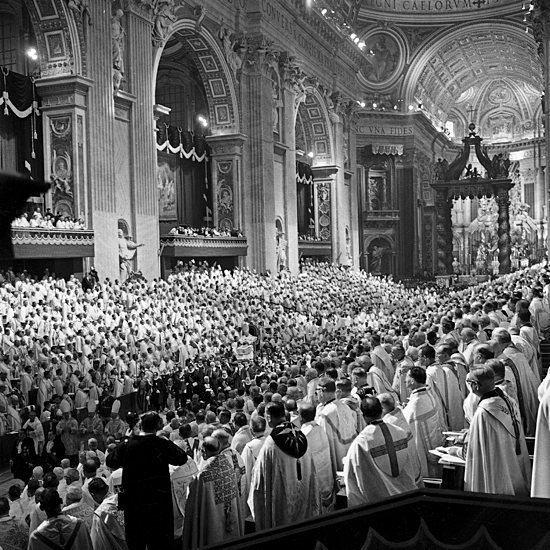 This basic posture gave Vatican II the freedom to consider a wide array of concerns. One of the first things Pope John did was send an open-ended letter to all of the world’s bishops, asking for suggestions for the agenda. As the council unfolded, the language of collaboration, cooperation and dialogue took center stage. In the end, the breadth of topics treated and the positive tone of its final documents set Vatican II apart from all previous ecumenical councils. But Pope John believed that God was moving humanity to a new order of human relations. The church needed aggiornamento — or “updating” — not because the church felt threatened but because of its great desire to share Christ with others. John XXIII was no naive optimist. As a papal diplomat in Bulgaria, Turkey and postwar France, he had seen the horrors of war and the tremors shaking Europe to its core. He became pope in the shadow of the Holocaust, amidst the dismantling of colonialism, the rise of the Cold War and on the cusp of a technological transformation unlike anything the world had seen since the Industrial Revolution. What is remarkable is that Pope John — and by extension the Second Vatican Council — did not retreat from the challenges of the times. His experience taught him that the church cannot escape the world or simply pronounce judgment on it. We must demonstrate the truth of our teaching and not simply condemn those who disagree, he thought. In the end, the church should “show herself to be the loving mother of all, benign, patient, full of mercy and goodness” toward all, he said. Hahnenberg is Breen Chair of Catholic Systematic Theology at John Carroll University in Cleveland.